A history of the Dale class of frigate. “It is a hard life aboard a Man-O-War.” –Captain C. Garrett, USS Dale, at sea, near the equator, 9th January 1841. When Congress passed the Naval Act of 1794 providing for the construction of six frigates, it called on Joshua Humphreys to design them. Humphreys (1751-1838), a successful shipbuilder in Philadelphia, owned the Wharton-Humphreys Shipyard on Front Street along the Delaware River in Southwark. He was appointed Naval Constructor on June 28, 1794, and began work on the capital ships of the US Navy’s fleet. The federal government purchased his shipbuilding operation and the surrounding land in 1801, and established the first United States Naval Shipyard there. Humphreys’ vessels, United States, Constellation, Congress, Chesapeake, President, and Constitution formed the core of the United States Navy during the War of 1812. 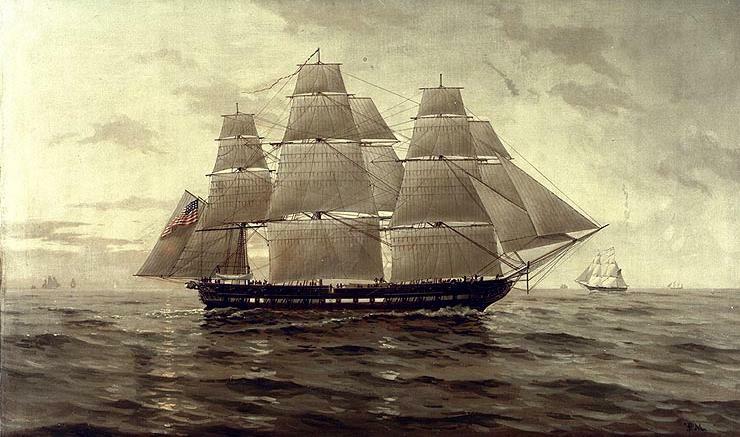 Constitution, launched in 1797, earned the nickname “Old Ironsides” after a battle with HMS Guerriere, in which most of the British cannon fire bounced harmlessly off its hull. Constitution is the oldest floating commissioned naval vessel, and can be seen at Pier 1 of the former Charlestown Navy Yard, at one end of Boston’s Freedom Trail. The building of the 120-gun ship-of-the-line Pennsylvania, America’s largest wooden sail warship, dominated the Philadelphia Navy Yard for fifteen years, and employed over one hundred carpenters and one hundred seventy mechanics. 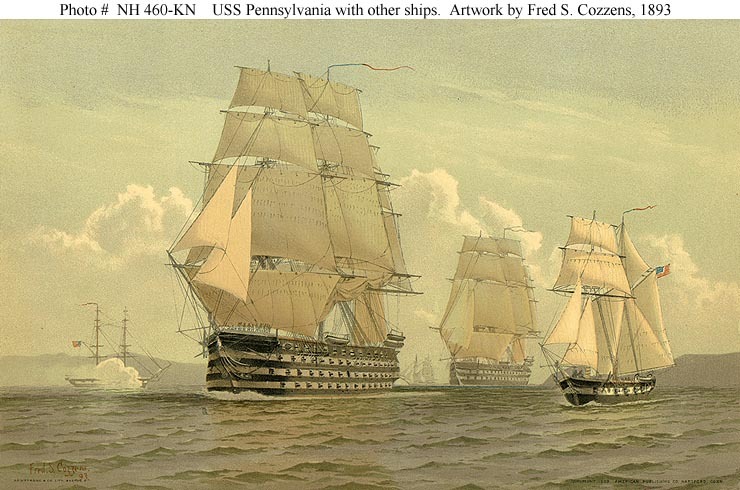 Pennsylvania was launched on July 18, 1837, and made but one voyage to Norfolk. There she laid up until April 20, 1861, when she was burned to the waterline to prevent her capture by Confederate forces. The “ship-of-the-line” was integral to contemporary naval battle strategy. Heavy-hulled ships with rows of guns maneuvered into columns across from their opponents, turned broadside, and opened fire. This style of battle, which had been used since the seventeenth century, would become obsolete when steam powered vessels became part of naval fleets in the 1840s. The ironclad warship, first used in 1859, paved the way for modern battleships, and as the nineteenth century progressed, frigates like the Humphreys vessels were relegated to supporting roles. But let’s go back to the 1830s, when the Navy Commissioners called for a smaller class of sloops-of-war to augment their fleet for services abroad, and Naval Constructor John Lenthall’s designs were chosen for what eventually became known as the Dale class of frigate. Steam-powered vessels were becoming more commonplace in naval fleets, but the Navy Commissioners were not quite read to make the leap from sail to the still-experimental steam ships. The Dale class of ships, similar in design to the Humphreys frigates, were among the last sailing vessels of war constructed in the United States. Dale and the other four ships of the Dale class, Decatur, Preble, Marion, and Yorktown, were all constructed at different Navy Yards, and all were launched in 1839. The history of the Dale from its construction through the end of its 82-year career, is recounted here through a journal entry, excerpts from a letter written by the captain of its maiden voyage, paintings done by one of its crewmen, naval records, and photographs. After taking leave of the family, John Hendrickson, Father and Mother Hill, Maria and I started for the Navy Yard. We stopped at the entrance and asked permission of the guard to go in, which he granted. We tied the horses and left them standing in the street. After passing the guard at the entrance the next was a soldier who appeared to be completely armed with musket and bayonet and dressed in a soldier’s uniform. John Hendrickson was a little before the rest of us when the soldier in authentic but civil manners beckoned him to come there. He then asked where he was going and what his business was and the company he had with him. After giving him the satisfaction he wanted, we passed through the yard where there was a cannon and cannon balls in abundance from 6 to 36 pounders. We were met by, I supposed, the commandant of the yard and asked permission to go into the houses that are for the purpose of building vessels of war in. There are two of those houses, on of which the ship Pennsylvania was built in. That house is empty at present. The other is called a frigate house. This has a vessel called a frigate in it, unfinished. The aforesaid officer looking gentleman called to a man and told him to go unlock the door and open the window that we might have the opportunity of seeing. We went in and went up the flight of stairs built for the purpose of getting on board. This vessel is about as high as a 4 story house. We went on board, and after viewing it from bow to stern and from top to bottom and outside and in, went down. This is what is called a 16-gun frigate. The holes that were left for the masts were about 3 feet in diameter. We then went through the large house to the wharf where they keep a small sail boat called a sea gull in which they keep the sailors and a soldier stands guard to keep them aboard. We saw them take one on board while we were there. Dale returned to the east coast in 1843, and was refitted for a second cruise to the Pacific. In 1846, Dale sailed to Valparaiso where she patrolled the coast until ordered north for duty in the Mexican War. Dale’s arrival at the Bay of La Paz was instrumental in Colonel Burton’s defeat of the Mexicans at Todos Santos. 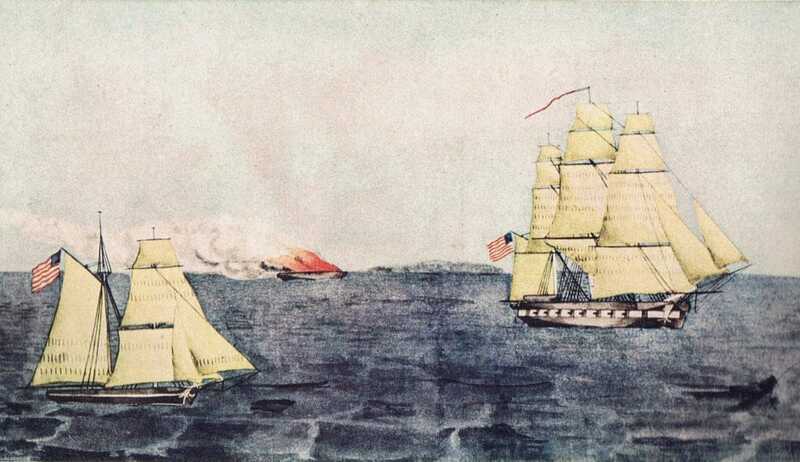 William H. Meyers, a gunner on the Dale, made colored drawings depicting the Navy’s action in the Pacific during the Mexican War. Dale arrived off Monterey, Mexico, in January 1847, and cruised the coasts of Mexico and California through the remaining year of the war. While on patrol, she captured several Mexican privateers and merchantmen, and landing parties she sent ashore raised the American flag over the towns of Guayamas and Muelje. The Mexican War ended in February 1848, and Dale continued to patrol until the summer of 1849, when she sailed for the east coast, arriving at New York 22 August 1849. In August 1851, at Johanns Island east of Africa, forces from Dale rescued the captain of an American whaling brig who had been unlawfully imprisoned. Also in 1851, a detail of Marines from the Dale helped suppress a mutiny on board the bark Paulina in the Comoro Islands. On 6 November 1857, Dale captured the slave trader W.G. Lewis. After almost a decade of patrolling the West African coast, Dale went out of commission in May, 1859, but she was not destined to remain inactive for long. In January, 1861, cadets from the Citadel attacked Union troops stationed at Ft. Sumter in Charleston, South Carolina. US Naval ships arrived to support the troops at Ft. Sumter on April 11, 1861. Establishing a blockade required a lot of armed vessels, and the United States had only ninety ships in commission when the war began. Of these, most were overseas, under repair, or otherwise unavailable for duty…Secretary [of the Navy Gideon] Welles armed a wide assortment of tugs and coastal packets to harry blockade runners, for almost anything with a weapon posed a threat to merchant ships whose only defense was speed, and hasted the return of those warships that had wandered abroad. Navy yard superintendents from Philadelphia to Portsmouth meanwhile rushed the refitting of two dozen ships laid up under their care and the completion of new ones, which the government had contracted. At Portsmouth the old sailing sloops Marion and Dale were sent back to sea by the second week of July . Dale joined the South Atlantic Blockading Squadron, capturing two schooners on the way to Port Royal, SC. Here she served as a store and guard ship until sailing north for repairs on 30 September 1862. With the exception of the Yorktown, which was sunk off the Cape Verde Islands in 1850, all the Dale class of ships served as guard ships at ports held by the Union Navy during the Civil War. After repairs, Dale arrived at Key West 10 December 1862 and served as an ordnance store ship until 3 July 1865. She was decommissioned at Philadelphia 20 July 1865, and was in ordinary at Norfolk until she was re-commissioned 29 May 1867. 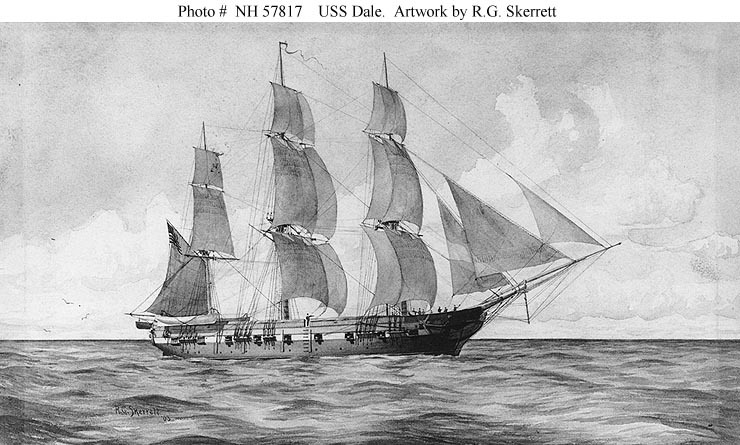 Dale was reassigned as a training ship at the Naval Academy until 1884, then as a receiving ship at the Washington Navy Yard. Dale was transferred to the Maryland Naval Militia in 1895, renamed Oriole on November 30, 1904, and transferred to the coast guard at Baltimore on May 23, 1906. The Treasury Department returned Oriole to the Navy in September 1921, and she was sold as a hulk to Mr. William Mattson of Baltimore on December 20, 1921. 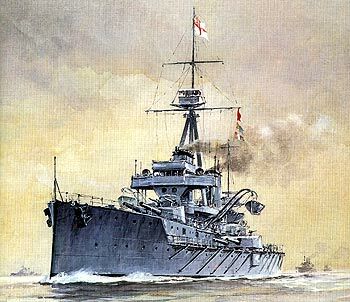 Dale’s 82-year career saw naval capital ships evolve from wooden sailing vessels to the likes of the HMS Dreadnought, introduced in 1906, which revolutionized battleships and set the standard for naval warfare in the early 20th century. Dreadnought boasted longer-range guns and faster steam turbine engines. Dreadnought was five times the length of the frigates built in the 1830s, and manned by a crew of between seven and eight hundred, compared to the one hundred fifty officers and crew aboard a ship of the Dale class. Technology continued to evolve through the 20th century, and the last battleship constructed for the US Navy was the USS Vanguard, in 1944. Aircraft carries became the capital ship of the Navy, though battleships were retained through the Cold War era for fire support. The last battleships were removed from the US Naval Vessel Register in March 2006.